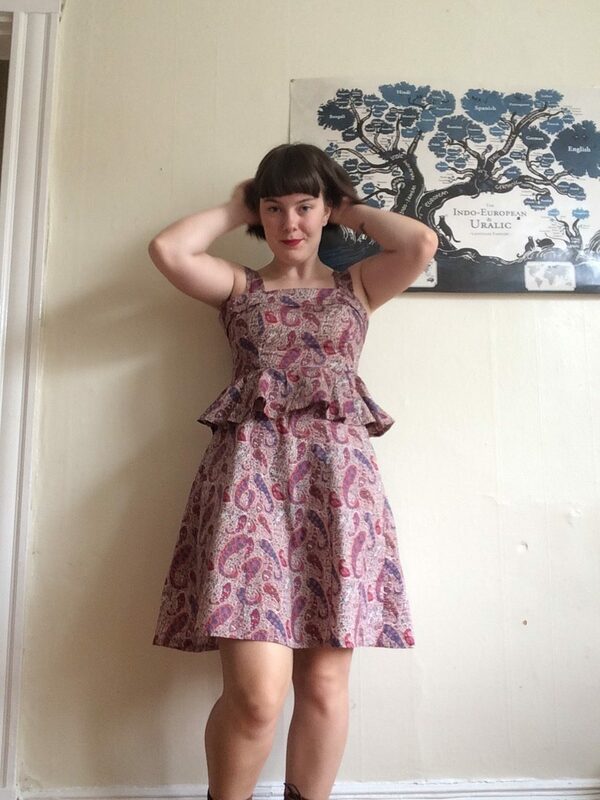 Two years ago, I stitched up a By Hand London Anna in paisley Liberty. 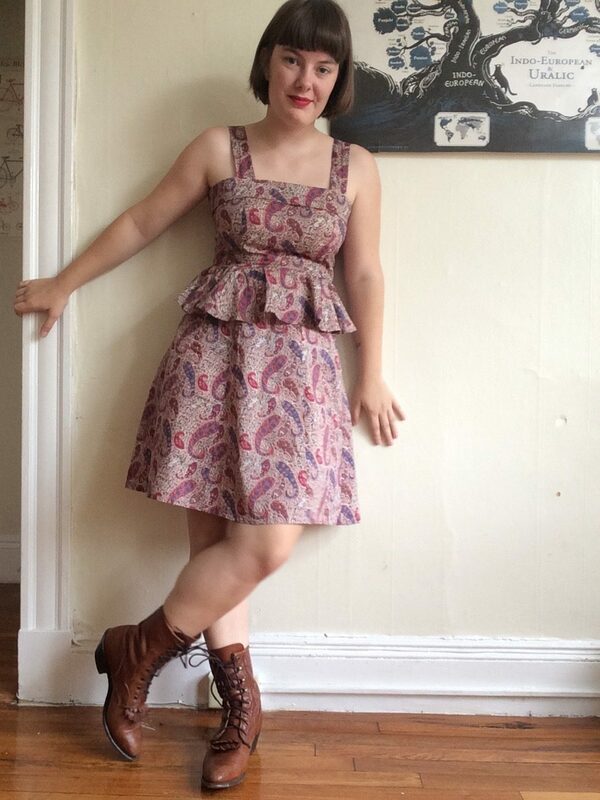 I loved that dress dearly and wore it hard for over a year, but last winter it developed a rip above the bust. I’d like to blame my impressive circus muscles, but it was more likely caused by poor posture and subtle fit issues that put too much strain on the bottom of the armscye. Whatever the reason, I wasn’t about to give up on such a beloved dress and so I stuck it on my “to-fix” shelf for a few months. It needed a new bodice, but I couldn’t use the Anna bodice again unless I was prepared to tackle the fit to prevent further rips. 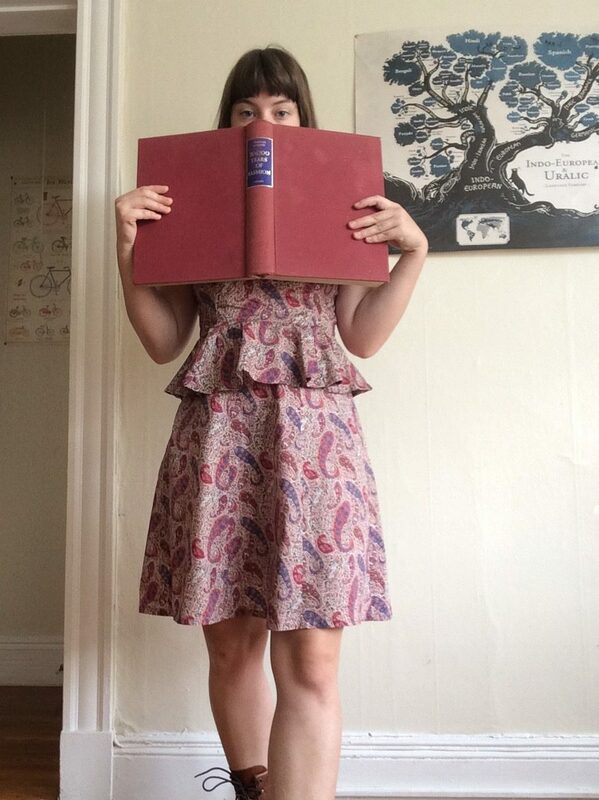 Eventually I decided to use the bodice of the Colette Lily, which I got on extreme sale and hadn’t yet made up. I, like pretty much everyone else, have struggled with the fit of Colette bodices/sleeves, but the Lily is delightfully sleeveless. The muslin fit quite well out of the envelope (graded from 6 at bust to 4 at waist to 10 at hip), though I had to pinch out a bit from the side seams in the bodice. The skirt is great and I will make it up in the future–I love the pockets–but unfortunately is probably not very bike-friendly. I stitched the bodice onto the skirt, but I wasn’t loving it. The simplicity of the a-line skirt seemed at odds with the little flap on the bodice, but without the flap it was a bit boring. So I made a last-minute design change. Separates! 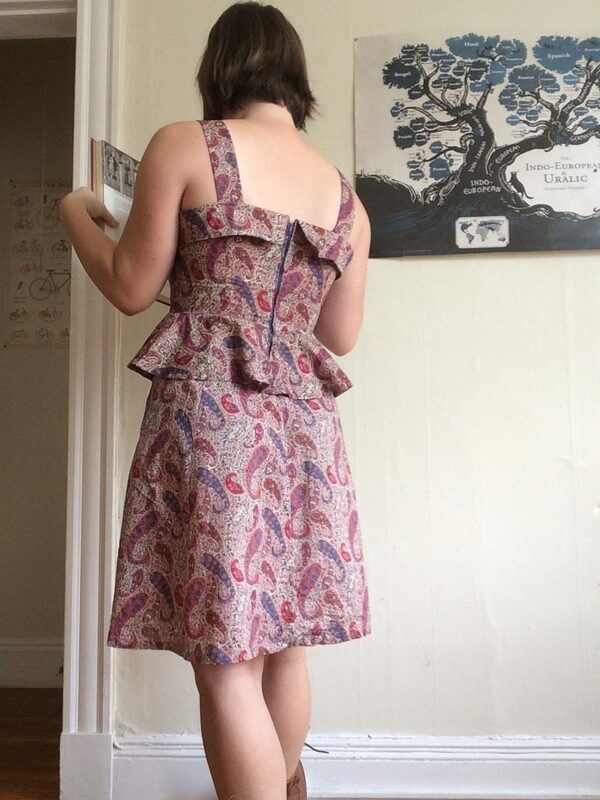 I cut the new bodice off the skirt and added a circular peplum, and trimmed down the top of the skirt until I could wiggle it over my head, then added an elastic waist. A regular waistband would have been preferable, but I didn’t want to deal with a zipper and didn’t have enough fabric to make a waistband piece anyway. It turns out, I love the elastic waist. It stays put better than a woven one, and since it’s only barely gathered around my waist, it’s not bulky underneath sweaters or shirts. I love my separates, which make a cute outfit together and can be styled apart as well! They feel unique and a little bit avant-garde in my fairly traditional wardrobe. An added bonus is that the bodice will still be wearable with other high-waisted skirts after this skirt inevitably wears out, having a whole year more of wear in it. I tried to have a little bit of fun with my self-timer phone-camera photoshoot, and pulled out 20,000 Years of Fashion to use as a prop, but it turned out to be so big it obscured a lot of the dress and I had to go propless for the rest of my photos. I’m trying to get comfortable enough in front of a camera that I can at least take pictures of myself without feeling awkward, and then maybe I can graduate up to asking other people to take pictures of me. This entry was posted in sewing and tagged anna dress, blouse, colette macaron, dress, refashion, sewn, skirt on September 7, 2017 by Alice.